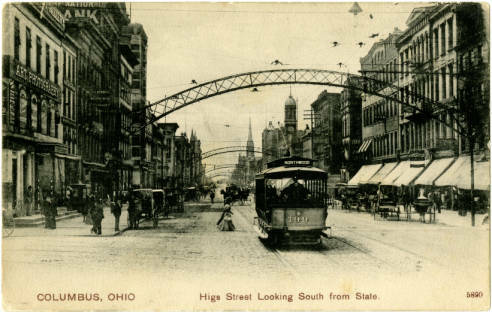 Black and white postcard showing a streetview of High Street looking south from State Street in Columbus, Ohio, 1907. This photograph and other images, paintings, and visual collections of Ohio history can be found at www.OhioMemory.org. Ohio Memory is the collaborative digital library of the Ohio History Connection and the State Library of Ohio, which includes collections from more than 360 cultural heritage institutions from all of Ohio’s 88 counties. Ohio History Central is maintained and was developed by the Ohio History Connection as a reference source for and about the people of Ohio. It covers topics related to the history, ancient peoples, archaeology, and natural history of Ohio through encyclopedia-style entries. Ohio History Central should be considered as a starting point for learning about the people, places, animals, events, and culture of Ohio. Individuals interested in primary sources related to the topics introduced in Ohio History Central should visit www.ohiomemory.org. Ohio History Central is designed to provide basic information about Ohio's past, or as a launching point for more serious research. All entries are copyrighted by the Ohio History Connection. To request permission to reprint an entry, or to use an image, email us at ohc@ohiohistory.org. Please feel free to link to any entry from your own website, blog, or social media account.